A thousand years ago, more or less, St Dunstan was regarded as one of the greatest of English saints. He’s all but forgotten now. I’m not sure how far Conn Iggulden’s Dunstan (published 2017) is likely to revive his reputation. In this novel the saint comes across as a deeply unpleasant person. He is quite prepared to blackmail, enslave, torture or kill his enemies, in order to complete his “great works”. He builds an Abbey at Glastonbury and a Cathedral at Canterbury. Reforming the Christian Church in England, he becomes the right hand of more than one English King. He secures his own authority and, almost inadvertently, wins peace and prosperity for a united England. At least for a time. Dunstan in Iggulden’s hands is a well-rounded character. His conviction of the righteousness of most of his actions is entirely believable. The few regrets he expresses complicate and make real his personality. 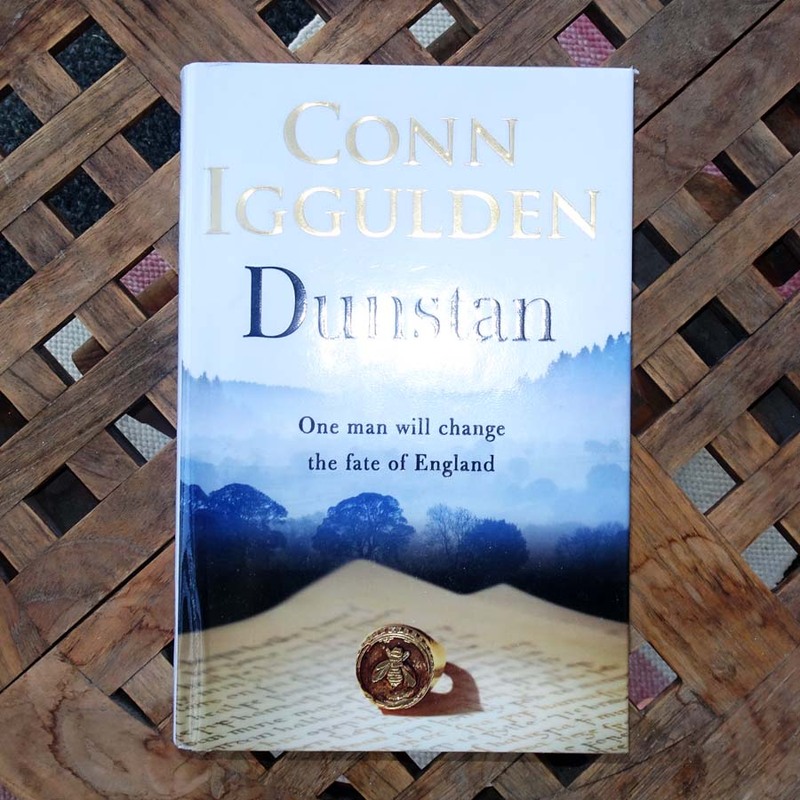 The world Iggulden builds up around him makes it entirely plausible, to me, that Dunstan could have behaved and justified himself exactly as described. A thousand years is a long time. Long enough for history to become legend; for legend to become myth (to paraphrase the Great Fantasist). When I was young, Dunstan lived on only in one or two legends and in the name of the charitable organisation known as St Dunstan’s. On the cliffs outside Ovingdean, just east of Brighton where I grew up, St Dunstan’s had a dramatically placed and purpose-built training and rehabilitation centre. Here they helped ex-servicemen who had been blinded during the war. I remember being driven past St Dunstan’s on many occasions. And I remember being told how St Dunstan is the patron saint of military men blinded in war. I believed it – and I think my parents who told me the story believed it too – but it was all a fiction. St Dunstan never had anything to do with the blind. It turns out that St Dunstan’s – now known as Blind Veterans UK – only took the name of the saint because the organisation was originally housed in St Dunstan’s Lodge in London. I’m telling this story because it’s interesting to contemplate the point at which history blends into fantasy and vice verse. Sometimes, as with “St Dunstan the patron saint of blind servicemen”, it has to do with the creative imagination crashing into ignorance. What writers of historical fiction do is not so far removed from this. There’s no crashing (or there shouldn’t be), but the creative imagination will inevitably find itself working with ignorance, which is the gaps in the historical record. The further back you reach as a writer of historical fiction, the less you are likely to be working with history, the more with myth and legend. I’m sure Conn Iggulden put in a good deal of work to flush out the historical detail of Dunstan’s life. However, given the stretch of time between now and then, the historical details must have been pretty thin on the ground. There is a Sussex legend about Dunstan as a blacksmith, the Devil and a pair of tongs. It’s probably the most well-known story involving the saint that’s still alive in folk myth. It was a delight to see how Iggulden took that story and made it plausible. In the novel there’s no devil any more (unless the devil is in Dunstan himself), but the story as told fits perfectly into the picture Iggulden paints. Back in May I was challenged to read Dunstan by @Stamphers. His tweet read “I can’t believe you’ve never read anything from Conn Iggulden, the king of historical fiction!” and included a link to Dunstan on Good Reads. I confess, at that moment the name Conn Iggulden meant nothing to me. After reading some of the high praise he gets for Dunstan, and after Googling him, I realise I have come across him before. I just never associated him with historical fiction. Why? Prejudice, pure and simple. First his name looks like the pen name of someone trying to be taken as a fantasy author. And then a quick skim through his book titles gives me Lords of the Bow, Bones of the Hills, Stormbird, The Blood of the Gods. Come on! They must be fantasy titles. If you were being kind you might say that my idea of Conn Iggulden was another example of the creative imagination crashing into ignorance. But I think prejudice is a fair word to use. I’m not a great enthusiast for fantasy (though George RR Martin is winning me around). I just assumed, on poor grounds, that Conn Iggulden was another in the parade of sub-par Tolkien imitators. I’ve been pleasantly – very pleasantly – surprised. So, thanks to @Stamphers for that, and to Conn Iggulden. I’m glad you enjoyed it. I’ve read Conn Iggulden’s latests fantasy and I must say it is horrible! The writing is excellent, as usual, but the story is clinche and the characters bland. His mind works best with something to already base his imagination on, that’s for sure. Which makes me wonder if he’s ever done a fanfiction… I think he would be good at it. Perhaps historical fiction is fanfiction, of sorts. Aha! So he does write fantasy as well. Good to know (and to avoid). “Perhaps historical fiction is fanfiction, of sorts.” That’s an idea worth examining. Wikipedia says fan fiction is “fiction about characters or settings from an original work of fiction, created by fans of that work rather than by its creator”. The top definition on the Urban Dictionary says it’s “when someone takes either the story or characters (or both) of a certain piece of work, whether it be a novel, tv show, movie, etc, and create[s] their own story based on it.” So historical fiction is not fan fiction by either of those definitions. Historical events and historical personalities are not “original works of fiction” nor do they originate in novels, TV shows or films. It’s certainly true that many historical fictions use (reuse) characters who really existed and left a trace in the historical record. These characters are given things to do and say that may be based on historical facts – but more often are based on probability. Characters in fan fiction are similarly plucked from their original context and given new actions and words. And then there are certain characters and certain periods that are immensely attractive to authors/fans. (I’m thinking of British history in the 1500s here. The Tudors – both the period and the people.) So immensely attractive, so worked over, that it’s likely many fictions do derive at least some characters from novels, tv shows or films rather than from the historical record. So, yes, I’m inclined to agree. At least some historical fiction probably is a sort of fan fiction. I don’t think Iggulden’s Dunstan falls into that category though.